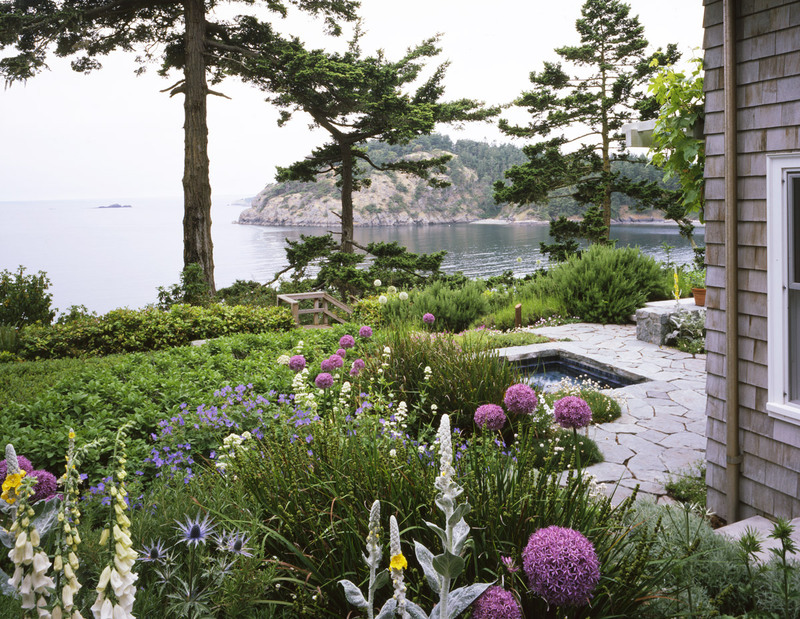 An island off the Washington coast is the setting for a woodland garden. From a bayside cliff near the foot of Lopez Island, the low screech of an eagle and the lapping of small waves are often the only sounds. Lopez is one of the San Juans, a constellation of islands inside Washington state’s marine waters. White peaks of the Olympics in the distance and the passage of the occa­sional orca whale or kayak complete the scene. 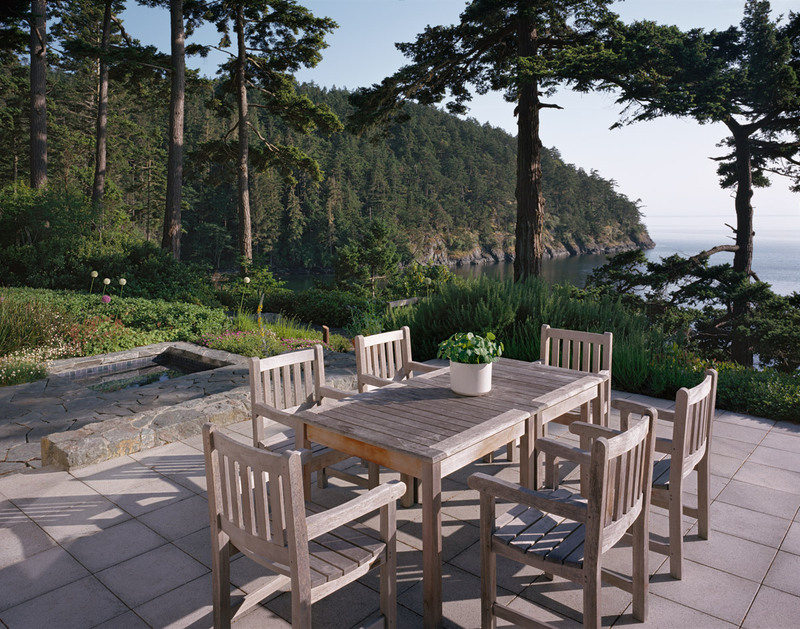 This vastness is the final destination for the landscape sequence at the San Juan House, which sits very near the land’s edge above a small beach. Paul Broadhurst, asla, of Paul R. Broadhurst + Associates, has based his design for the site on the under­standing that this reward should not be rushed. In fact, it is best when dis­covered after a walk in the woods. The site has its own story, and the closeness of trees and memories provides the for­est yin to the yang of the cliff and water scenery. Broadhurst points to one of the larger evergreens on the site, where a large winch is embedded in the bark – a tribute, he says, to the ingenuity of the former owners, who hauled their provi­sions up from the water. Still reachable only by ferry, Lopez has long been a ref­uge for artists and independent-minded settlers such as the two women who had made a life for themselves here. The new owners, who divide their time between Lopez and the Baja Peninsula in Mexico, were drawn to the place by the peaceful seclusion and the scenery and wanted to enjoy it and share it with guests. They brought Broadhurst, who had designed the landscape for their previous home in Seattle, to re­view the site from the air. Broadhurst’s work began with a plan that includes a rebuilt and expanded main house, a garage, and a guest cot­tage. The geology of the shore limits development in a very natural way. Because the bedrock comes so near the surface around the bay, septic systems are not easy to site and limited in capacity. Wells must not be overdrawn, or seawater begins to seep in. There are other limits to development, including a very aggressively enforced shoreline ordinance and a nature con­servancy as far as the eye can see on one side of the bay. The plan for the landscape, right, brings the forest understory and midstory through the compound at the back of the house, while the waterside is designed to accommodate furnishings and gatherings, top. Native plants and rock work edge the spa, above. Ornamentals are largely confined to the gardens that lie inside two fenced enclosures, spilling out only slightly for spare seasonal color. Respecting these conditions, care was taken to make use of the existing house and garden footprint and to heal the forest floor outside the building and walkway parameters. The septic field is located under a “meadow” that lies inside the edges of the compound. The site narrative begins with the enclo­sure in the forest and ends with release on the shore. 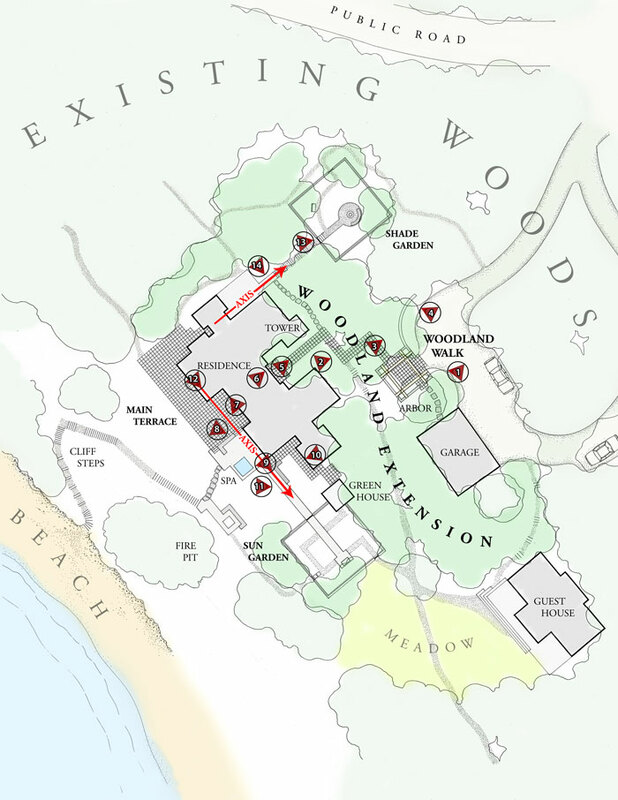 The looped driveway ap­proach to the site is upland and to one side of the compound. A small paved ar­bor court stands beside the garage, pro­viding an arrival point and setting up the entry sequence. From there, stepped pavers seem poised just above the forest floor, descending lightly into the newly constructed woodland and the entry to the house. Before reaching the door, a footpath de­parts to go around the walls, passing the enclosed garden above before joining the expansive waterside patio and its vari­ous courts. Either choice – into the front door and the light-flooded interior or around to the other side of the house ­leads to a sudden encounter with water, sky, and shore. The experience of break­ing through to a clearing in the woods is augmented by the sensation of arriving at the edge of a precipice. As a designer, Broadhurst is obsessed with the margins between built and un­built, structure and chaos. This shows in his handling of the concrete steps and pathways through the forest. The large, etched pavers are molded to order in four forms – flat, edge, right and left cor­ners – and placed over a poured concrete foundation with reveals so that they seem to float above the chaos of the ground. Broadhurst has done more than heal the ground next to the buildings, where the forest path leads down to the house. Soil was imported and built up to create a special intimacy between forest floor and architecture. From the interior of the house, the result of this land sculpting is to heighten contrast between the cool embrace of the forest on one side and the bright, open view on the other. Broadhurst also paid respect to the lega­cy of “the ladies,” as he calls the original owners, enclosing a vegetable and cut­ting garden in a more permanent stone wall precisely where their deer-proof wire fence and garden had been. 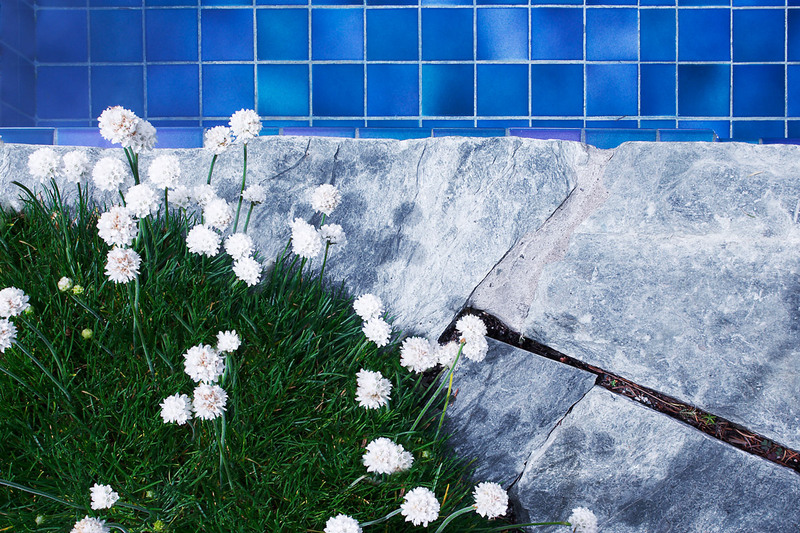 The pebble mosaic squares of their patio now pave the landing on the steep path to the beach. 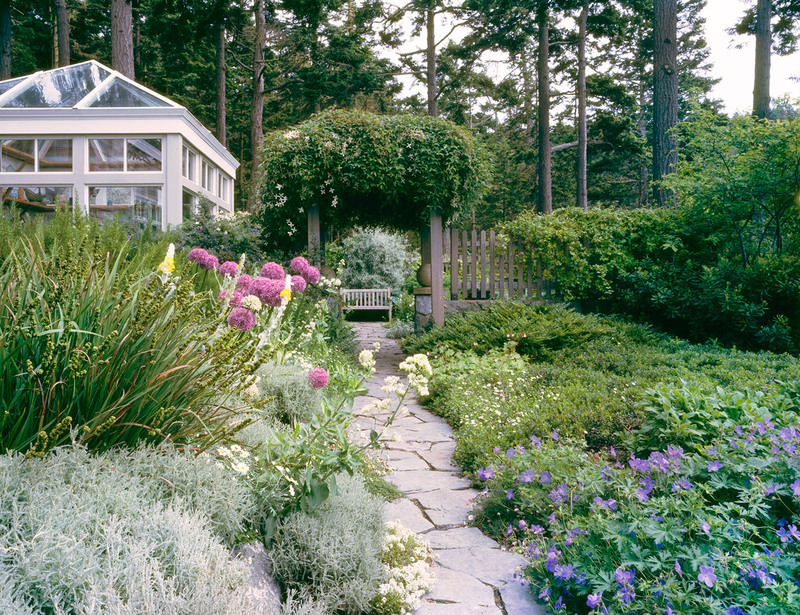 The traditional gardening areas desired by the owners (including the original owners’ reinvented vegetable garden) are walled off from the rest of the landscape. In this way, the built environment is tightly controlled so that the woodland areas can be more clearly at one with the native surroundings. 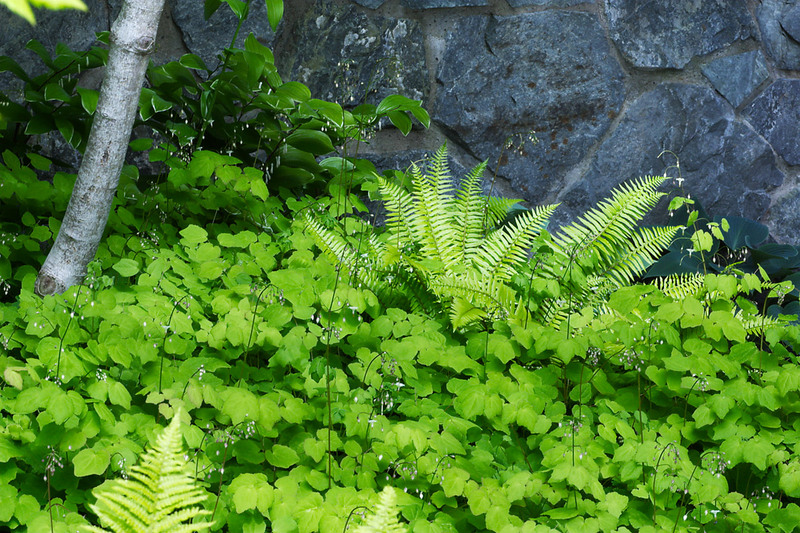 Broadhurst, who came to the Pacific Northwest from his native England on a fellowship and stayed to study and de­sign upscale residential gardens in the Seattle area, has never lost his fascina­tion with the natural environment of the mountains, the Columbia Gorge, and the coast. 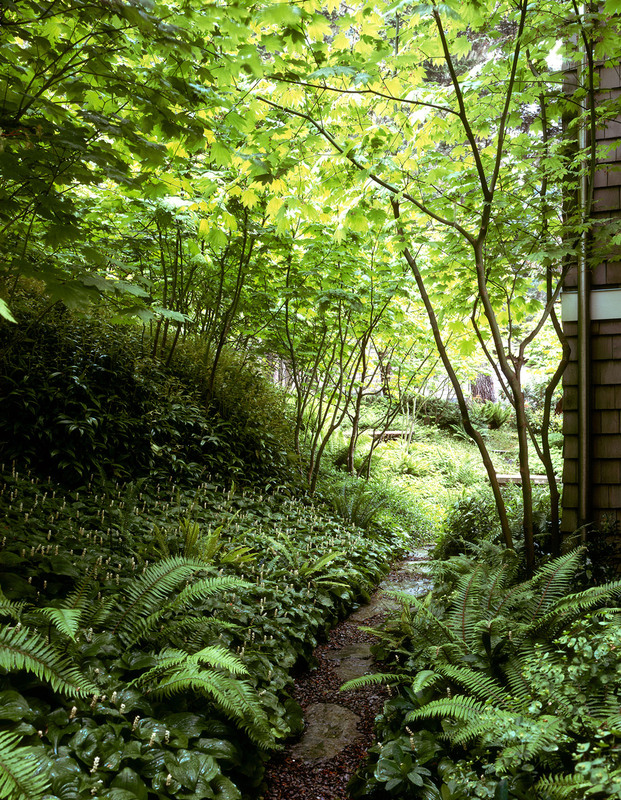 He has made a special study of the Northwest plant palette, adapting it to complement the decidedly modernist lines of his pathways and hardscapes. 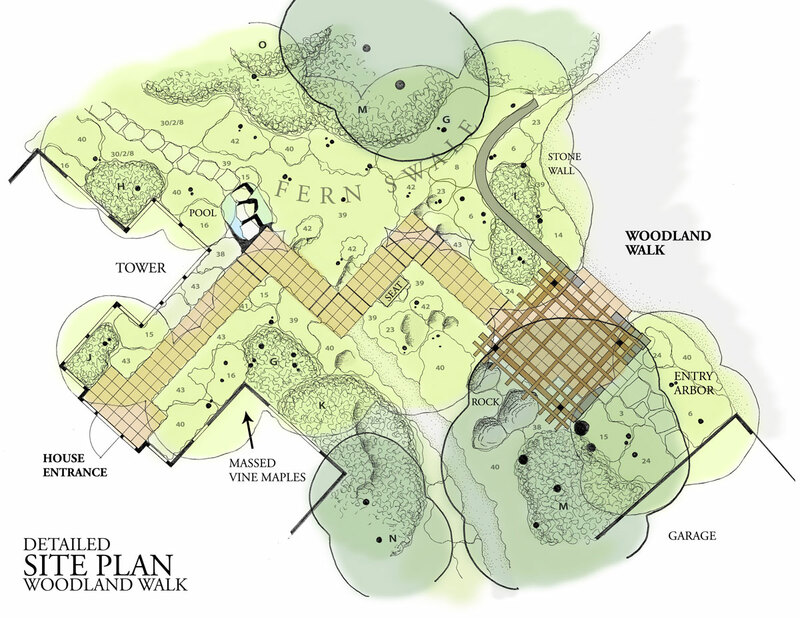 On the upland side of the house as shown in the plan, below right, where the slope between driveway and front door is traversed, paved steps seem to float above the forest floor, right, and the native plantings, top right, blend with the island environ­ment. The landscape is intimately connected to the forest surroundings, preserving midstory plants and providing a network of paths through the site, above. Broadhurst finds that native plants are perfect communicators. Having corralled specialized areas for growing cutting flowers and vegetables, he gave the rest of the site at the San Juan House over to na­tive plants. Some – the tall Douglas firs, sinewy madronas, and rampant salal, for instance – were already established and had only to become part of the composi­tion. But he specified more than 25 na­tive species in the design. The exceptions are a strategic scattering of geranium, allium, and milkweed that drifts out from the enclo­sures and along level paths as if volunteering among the native plants. By deliberately drawing connections between popular commercial plants and species that are native to the Pacific Northwest, Broad­hurst shows how a native plant palette can be applied to a design framework of drift­ing ground cover, softly mounding midstory plants, and low trees – all under the iconic evergreens. Clair Enlow is a freelance writer in Seattle. 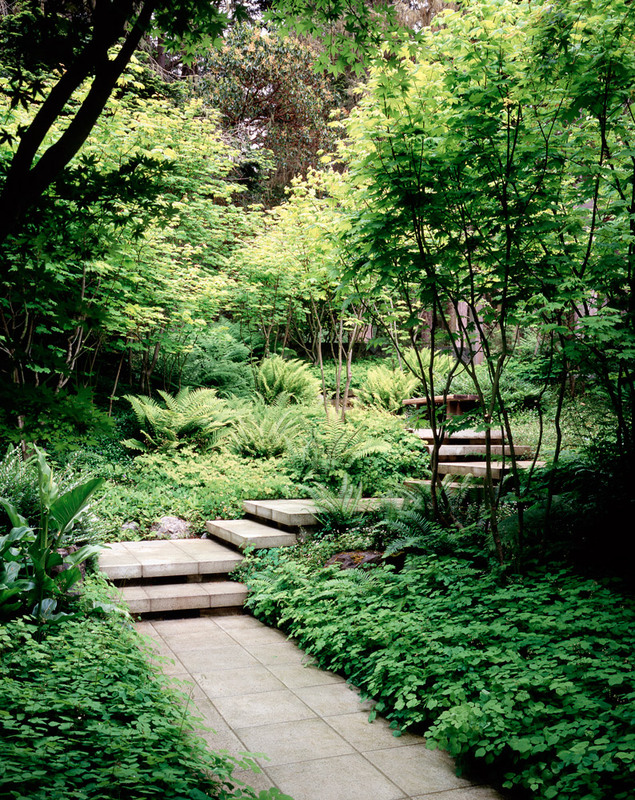 Landscape designer: Paul R. Broadhurst + Associates, Seattle. Stonemason and hard surface contractor: Michael Scharnberg. 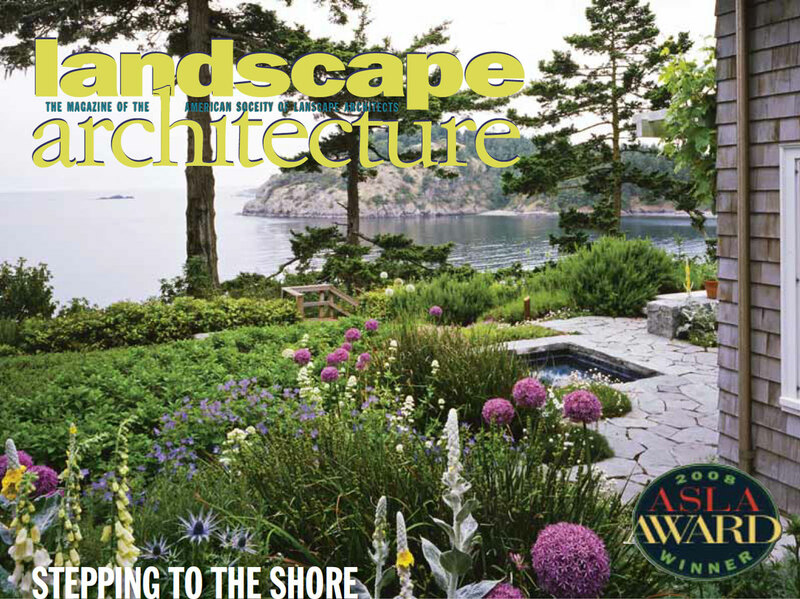 Reprinted with permission, Landscape Architecture, August 2010, © 2010 American Society of Landscape Architects. By IPA Publishing Services 800-2S9-04 70 (12190-0311) For web posting only. Bulk printing prohibited.